I confess I tried to wax the fine little hairs above my lip with wax strips. What happened? A chemical burn of some kind. Seriously that's how it feels. I'm plucking with tweezers for now on! I don't have very many hairs. Just a few on the sides of my lips that I want gone. Of course this happened right before school started. I think I'm going to white lie to my students, and tell them I put a lotion or make-up on my face that I was allergic to. They don't need to know that I was trying to wax my little hairs. If I told teens that they'd picture me having a full blown mustache. So what do you do when you have a chemical burn? As long as you show no signs of vomiting, fever, or faintness you just need to keep the area clean. This isn't that major, so no doctor visits for me. I imagine some do get that bad because they can lead to staph infections. I've been cleaning my face that's non-irritating formula. It's Vitamin C Cleanser. 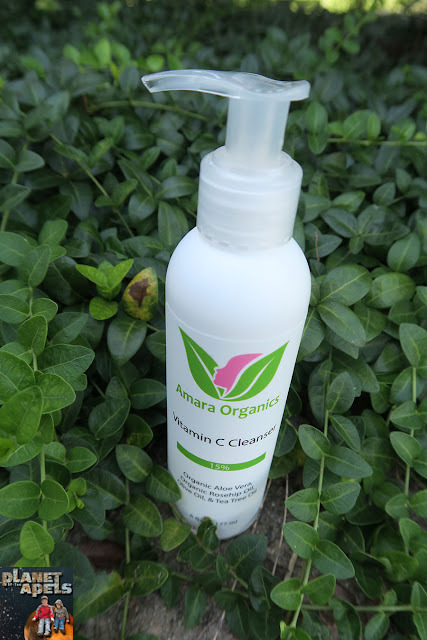 It's a face wash that has natural and organic ingredients. This product is safe for all skin types. It maintains a healthy moisture balance without stripping your skin. One thing I really like is that it doesn't make the skin feel tight, or dry. I don't have to worry about this product making my skin worse. What product(s) do you use to keep your skin clean? I once got a chemical burn from trying to use that nair stuff on my legs. It hurt like hell, but wasn't bad enough to go to the doc. Needless to say, have never used it again! I love using Vitamin C on my face. I also like to break open Vit. E capsules and dab it around my eye area. I would love to use this to help clean my face. I have some hair too but I leave them ;). This product looks good and save..